• planning specific strategies for enhancing their classroom learning environments. 1. 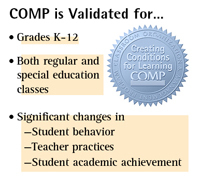 Students of teachers who have participated in COMP realize greater gains in academic achievement as measured by standardized tests than students of teachers who have not participated in the programs. 2. 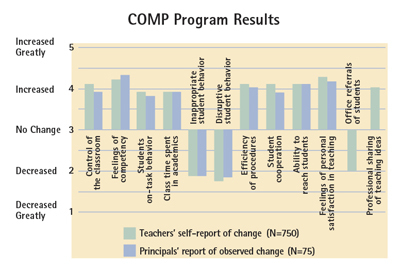 Teachers who have participated in COMP workshops show changed classroom practices that result in classroom environments more conducive to students’ learning. 3. Students of post workshop teachers show a significant decrease in inappropriate and disruptive behavior and a significant increase in academic engagement.